In Pokémon Go, whenever a Gym is controlled by a Team, its defending Pokémon can be challenged by Trainers from rival teams. A Pokémon's will (and ability) to fight is measured by a hidden stat called Motivation. Trainers will battle defending Pokémon and attempt to defeat them, which decreases their CP and Motivation, represented by a heart over the Pokémon’s head. As a Pokémon's Motivation is exhausted, its CP will be reduced, greatly reducing the challenge to rival team Trainers. When a Pokémon is left at a Gym, it will start with 100 percent Motivation, which will gradually deplete over time. This requires a team’s Trainers to keep an eye on defending Pokémon’s Motivation to ensure successful defenses (or to note opportunities to knock out rival Pokémon). You can check the Motivation of your own defending Pokémon by tapping the respective Gym's badge. A Pokémon will return to their Trainer after reaching zero Motivation and being defeated in a Gym battle. 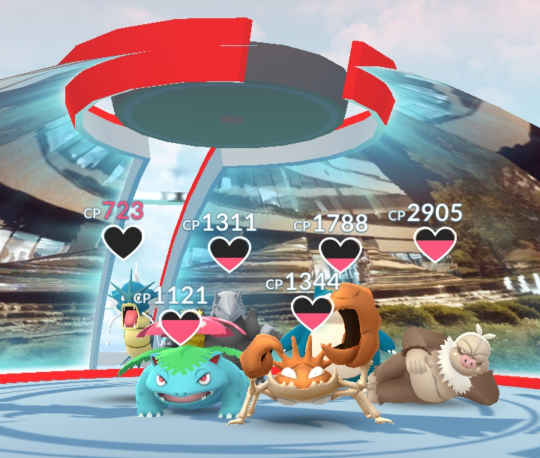 Once all six defending Pokémon has been removed from the Gym, by completely depleting their Motivation, the Gym can be captured by a victorious team. Pokémon will lose roughly 28% of their Motivation when defeated in battle. Pokémon with a CP of 3000 or over lose 10% of their Motivation (and CP) every hour. Pokémon with a CP under 3000 lose 1% of their Motivation (and CP) every hour. A defending Pokémon’s Motivation can be increased by Trainers from its team by feeding it Berries. Any Berry can be fed to Pokémon in a Gym, though you'll typically want to feed Nanab Berries. Nanab Berries grant the highest Motivation increase (slightly above Pinap and Razz Berries) and serve no other purpose. Feeding a Golden Razz Berries will fully restore a defending Pokémon’s Motivation. A Pokémon at full Motivation can still be fed Berries (for the benefits of the Trainer), however their Motivation will never go over its maximum. Berries fed to a Pokémon after the first will grant the defending Pokémon less Motivation, until the feeding timer resets. A Trainer can feed up to 10 unique Pokémon up to 10 Berries each in a 30 minute window, starting from the time the first Berry is fed to each Pokémon. These Pokémon don't have to be in separate Gyms, so you can feed all six defending Pokémon in a single Gym, if available. Razz Berry and Pinap Berry: Berries one through five will restore 12%, 4.8%, 2.4%, 1.2%, and 0.96%, respectively. Afterwards, each Berry (six through ten) will restore 0.8% Motivation each, with no further diminishing returns. Nanab Berry: Berries one through five will restore 15%, 6%, 3%, 1.5%, and 1.2%, respectively. Afterwards, each Berry (six through ten) will restore 1% Motivation each, with no further diminishing returns. Golden Razz Berry: Always restores 100% Motivation. Unless you're being extremely frugal with Berries, you should still feed the maximum of ten Berries to a single Pokémon, regardless of the diminishing returns. You're limited to feeding only 10 unique Pokémon total, regardless of how many actual Berries are fed, so you might as well earn all of the rewards you can. Tap on that Pokémon and select "Go to Gym"
It's important to note that remote feeding of Berries to defending Pokémon will grant 25% less Motivation than Berries fed in-person. That being said, the Motivation gains from remotely fed Berries are pretty useless in the grand scheme of things, so you may wish to hold onto your Berries until you're able to physically head out to local Gyms. Trainers who feed Berries to Pokémon will receive 20 Badge EXP and 20 Stardust. There is also a chance to obtain Candy for the Pokémon species fed. Feeding Berries also progresses the Berry Master medal, granting achievement milestones after feeding 10 Berries (Bronze), 100 Berries (Silver) and 1000 Berries (Gold) to defending Pokemon. Earning Gold Berry Master does not grant any benefits besides strange bragging rights. Once you've fed 1000 Berries, the medal will display a counter that continues to track the amount of Berries you've fed.